Z119 Fasciola hepatica, eggs, W.M. 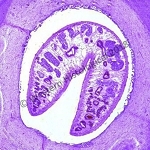 Z120 Fasciola hepatica, Sporocysts (infected snail), L.S. Z124 Fasciola hepatica, Adult, W.M. Z130 Taenia sp., Cysticercus, W.M. Z131 Taenia sp., Scolex, L.S. Z132 Taenia sp., Scolex, W.M.